There is a treadmill in our house. It does—occasionally—get used for something other than a laundry rack. So finding Matt running on it last week was not as much shocking as it was…suspect. In hindsight, I realized he was preparing for the Craz-E burger, the culinary creation born at The Big E, or the Eastern States Exposition. It’s the state fair of Massachusetts and several other New England states, and it’s where you’ll find the world’s largest traveling amusement park, the North American Midway. The four of us went to The Big E this past weekend, and brought along our appetites. After a few days cooped up inside with incessant rain, the sun shone on a clear, cool autumn day, and we happily hit the road. With a name like the “Big” E, we had to go. We wouldn’t be living up to the Blogocratic Oath (no such thing) if we missed it. I learned about the Craz-E burger while doing my research, and that pretty much sealed the deal. Matt has never met a burger he didn’t like. The more beef, the better. He’s been known to eat the triple patty Baconator at Wendy’s, but has stopped short at the quadruple BK Stacker at Burger King. He prefers food which could seal his arteries in under ten minutes. Yes, his life insurance policy is up-to-date. 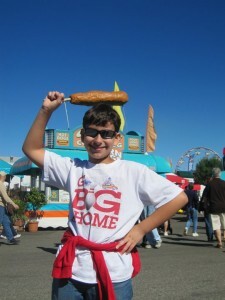 I've read an unsubstantiated claim that this is the world's largest corn dog! So when I reported that the Craz-E burger is a bacon cheeseburger sandwiched between two halves of a glazed doughnut, he got a glint in his eye I haven’t seen since our first date. “Lustful” is an apt description. The Big E lives up to its name. It’s massive, and we walked miles that day. There’s a lot to do and see, and I’m sure we missed most of it. Of course we hit the expanse of midway rides. We also saw out first horse show, and visited some of the 4H pavilions. The Girl made friends with Doug the Llama. We caught a hysterical show by Hilby, the Skinny German Juggle Boy. We’ve also—purely by chance–seen him at the Woodloch Resort and the Dutchess County Fair this year. So now we’re juggler groupies, I guess. And of course, there’s the fair food, which never disappoints. Matt’s 1,500-calorie Craz-E burger held him over most of the afternoon, until it was time for the other specialty, the Big E Cream Puff, and its cousin, the E-Clair. We also made room for hot dogs, pierogi, samosas, and overpriced ($5.00!) milk shakes. You’re dying to find out how the Craz-E burger tasted, aren’t you? Good thing I do the wordsmithing around here. I took one bite, for research’s sake. If you like the combination of sweet and salty, and have a palate for rich foods, then you would like this. The doughnut was soft, silky, and melted away sweetly. The burger had a great flame-broiled moistness. The bacon flavor didn’t really come through, though. The only cross-state agricultural fair in the U.S., the Big E serves as the state fair for MA, RI, VT, NH, ME and CT. The first Eastern States Exposition took place in 1917. Its name was changed to “The Big E” in 1968. What’s better than butter? 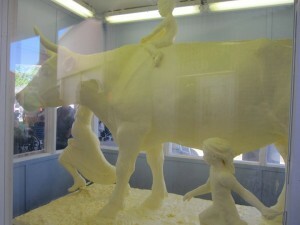 600 pounds of butter is better, I bet. 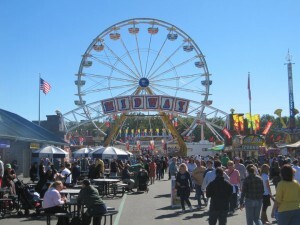 This year The Big E took place September 17 through October 3. Fairgoers consumed 45,000 cream puffs, 16,000 Craz-E Burgers and 1,300 gallons of Rondeau’s Dairy Bar ice cream. Exhibitors showed 793 dairy cattle producing 32,000 lbs. of milk, 462 beef cattle, 1,167 sheep, 450 goats, 159 llamas, 263 alpacas, 52 swine, 52 teams of oxen and 731 horses. We ended up in one of a hundred private lots near Gate 7 which only cost $5 more than official parking, and worth every penny to finally get out of the car. We’ve decided as a family to rate this event a 5, which takes into consideration the great food selection. We’re a bit jaded, because our hometown fair, the Dutchess County Fair, is a pretty tough act to follow. 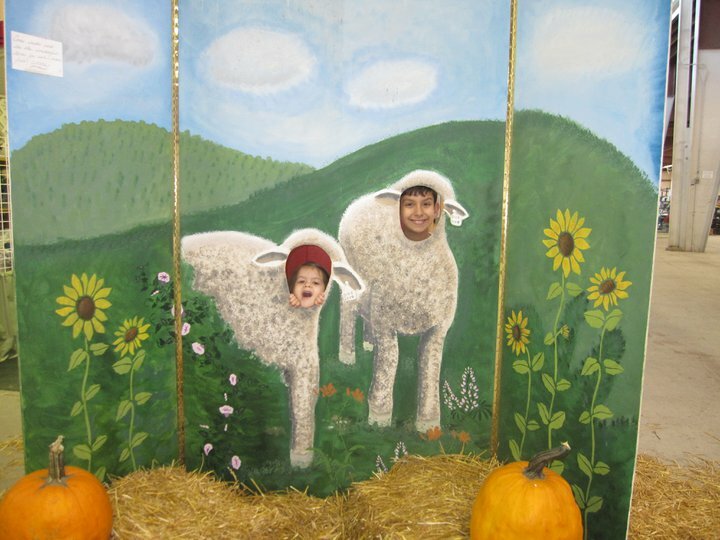 Did I mention that The Big E is largely an agricultural fair? Matt, do you pop blood thinners after these burgers? Didn’t have time to read all of this yet, but can’t wait to go to the BIG E… it’s been on my list a long time! The pics and following this trip on facebook has been fun. Thanks for the info — feels like going there, before we go there. Don’t eat beef, but the men would go crazy for the burger! Glad you had fun at the Big E. That’s my hometown (aka West Side) you were in and I’m proud of it. I am CRAZY about the Mini-Donuts!!!! I don’t think we saw those! We’ll have to look for them if/when we go back this year. Ha! We love the Big E … but call it the Big EAT! 🙂 Makes me want to go home to Massachusetts!